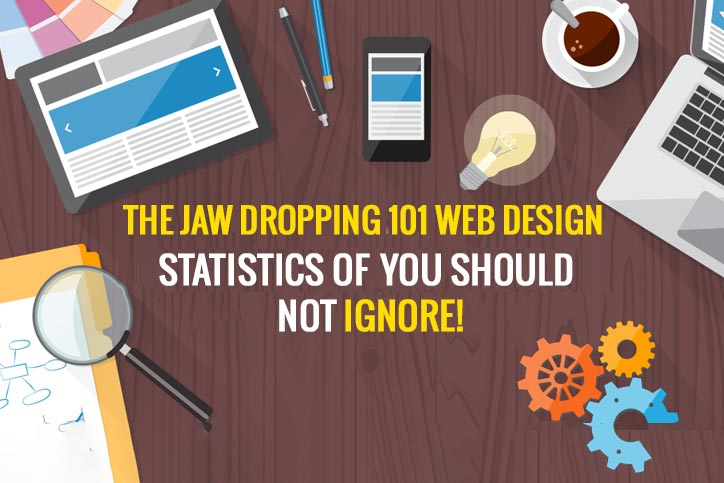 The Jaw Dropping 101 Web Design Statistics of 2019 You Should Not Ignore! You mostly have just 10 seconds to leave an impression to the user, after this (often times before) he/she will leave. ” A non-responsive site is a back button magnet. Users typically make an opinion within .05 seconds after jumping on your website – Kinesis Inc.
67% of shoppers showed more interest to buy from a website if it is compatible with mobile devices. As a part of this rapid change, the way of designing your internet platform is also getting changed at a lightning speed, as we can see a new design daily on Internet. This blog post is basically offered to provide you some amazing Web Design statistics. Apart from developing, a web platform is all about web designing, responsive designing, and graphic designing. These three are the most important pillars of a web platform, as we know very well that the design of any website leaves the first impression on any user. Talking specifically, web designing of any website is experiencing rapid and drastic changes, which is important, because no one wants to see the same old design again and again, so it is really very necessary to change the way of design along with time. Be sure to improve your user experience by using these web design trends 2019. Coming next to the responsive design, it has become one of the most important factors for any website after 2015, as Google has started giving priority to the websites which are mobile responsive too. The giant search engine has taken this step after looking at the enhancement in the number of smartphone users across the whole world. Lastly, there is graphic designing, which is used to make your website more attractive and ravishing. All of these designing techniques are experiencing intense changes, which are also important with this rapidly changing technology. 1. 39% of the people across the world will stop engaging with a website if images won’t load or take too long to load. 2. Desktop internet usage has dropped by 1% in the time period between December 2013 and December 2015. 3. A single second of added page load speed can cause sales drop by 27%- Soasta. 4. On an average, 83% of global consumers reportedly multi-screen using 2.23 devices at the same time- Adobe. 5. Web Pages, which loaded in 2.4 seconds experienced great mobile conversation rate of 1.9%- Soasta. 6. Average connection speed gets a hike of 14% every year, it was 6.1 Mbps in Q2 2016- Akamai. 7. 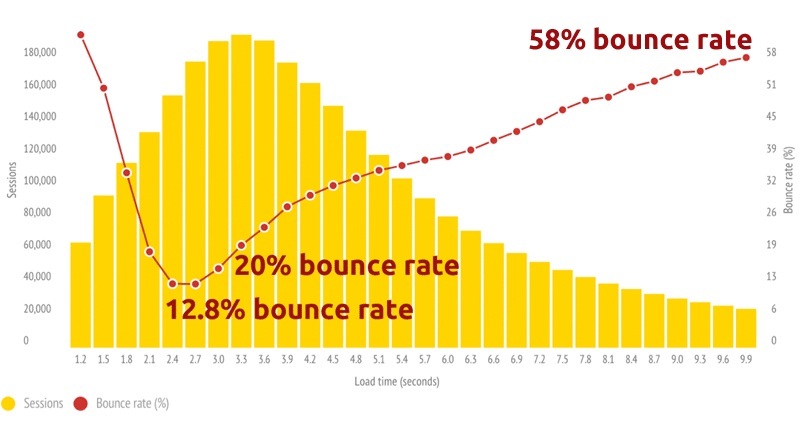 Web pages, that load in 2.4 seconds had a bounce rate of 12.8%, whereas the pages that load in 3.3 seconds experienced a bounce rate of 20%- Soasta. 8. A regular optimization of any website will result in 113% jump in visits and 117% increase in clicks on that site. 10. Nearly two-thirds of people would rather read beautifully designed content instead of something expressed plainly. 11. 38% of people would stop using a website if its content/layout is unattractive. 12. 48% of people mentioned a website’s design is the most important factor in deciding the credibility of a business. 14. 47% of people expect a web page to load in 2 seconds or less. 15. 64% of total visitors want to see the company’s contact information on its homepage. 16. 44% of total website visitors will leave a company’s website if there’s no contact info or contact number given. 17. Peer-created content is less likely to be questioned. 18. 62% of companies increased their sales by designing responsive mobile platforms for their websites. 19. 40% of people will switch to a different search result if the first one is not mobile friendly. 20. 48% users say if the business site of a company is not mobile friendly, they’ll take it as an indication that business is simply not caring. 21. 90% of the people use multiple screens sequentially. 22. Mobile devices now spend nearly 2 of every 3 minutes online. 23. Global mobile data traffic grew up to 74% in 2015- Cisco. 24. 13% of adults access the internet only via mobile, while 11% accesses only via desktop- ComScore. 25. Smartphone users check their smartphones nearly about 150 times a day. 28. 94% of people mentioned web design as the major reason they mistrusted or rejected a website. 33. 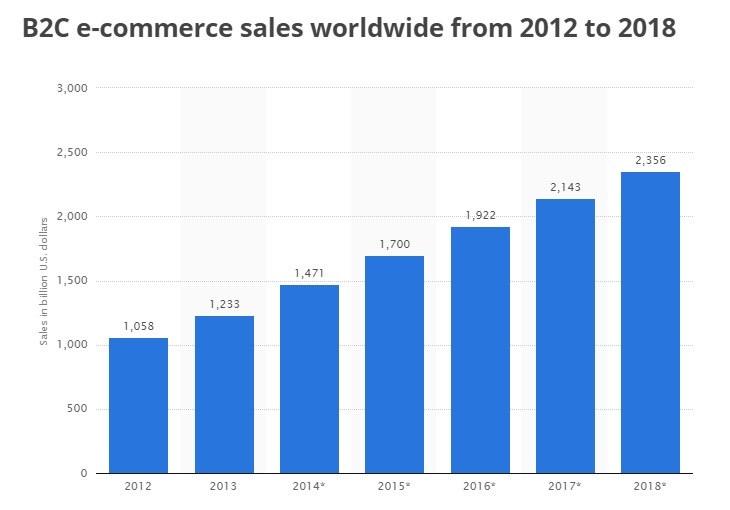 Worldwide B2C e-commerce sales reached to $ 1.7 trillion in 2015 and are expected to reach $ 2.35 trillion by 2018. 34. 8 out of 10 consumers will choose online shopping if free shipping is offered. 35. A hike from 8 to 2 seconds in site speed can boost your conversion rate by up to 74%. 45. 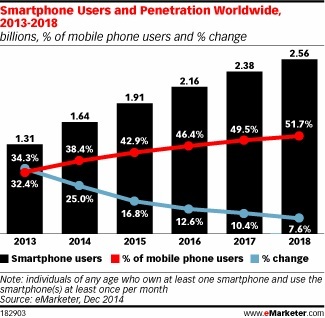 34% of smartphone users go online mostly by using their smartphones. 47. 4 out of 5 smartphone users access retail content on their device monthly. 48. Google started rewarding sites, which were built responsively for multi-device support from April 21, 2015. 49. This major update was known throughout the Internet as Mobilegeddon. 50. Out of 100 sites analyzed, only 11.8% on an average use responsive design. 52. 70% of the total small business websites do not have Call to Actions on their home pages. 53. 85% of Website Visitors expect the mobile version of the website to be a bit faster. 54. 47% of users expect a maximum of 2 seconds loading time for an average website. 55. In a duration of 15 minutes, about 66% of users will prefer beauty over plain design. 56. 38% of people will leave a website if it fails to deliver attractive content/layout. 57. 48% more traffic is produced from websites, which have 51-100 pages. 62. 48% of the visitors voted website design as the number one factor in affecting the credibility of the website. 63. 72% of people trust online reviews and make their purchase decisions. 64. Sales of the companies boosted, which developed their website for mobile platforms and 64% sales increased for the companies, which designed their websites for tablets. 65. 45% users abandoned the front page if the loading time of page increased by 3%. 66. 94% of the visitors closed websites and stopped trusting the site if it has a degraded web design. 68. 49% of websites based on HTML5 get high page views than simple sites. 69. Use of intense colors increased web recognition to around 80%. Websites that use dark colors experienced 2% of growth, whereas light color themed sites experienced 1.3% growth. 70. Content with bullet lists engaged 70% of the users whereas 55% of customers were engaged on content, which lacks bullet listings. 88. 4 out of 5 consumers shop on smartphones. 93. 46% of mobile users report having difficulty interacting with a web page, and 44% complain that navigation was a bit difficult. 97. 39% of users abandon a website if images don’t load or take a time to load. 98. 48% more traffic is produced from websites that have 51-100 pages. 100. 85% of Website Visitors expect the mobile version of the website to be faster. 101. 38% of people will leave a website if it fails to produce attractive content/layout. These are the statistics, which have been obtained by deep research and case studies. By following these points or working according to these stats, you can enhance the consumer or user base of your website. The enhancement of your user base will undoubtedly result in the increment of revenues as well as your popularity. Hence, by this, we can also see that the design of a website plays a major role for your digital business platform, as we all must have heard a saying, “First impression is the last impression”. 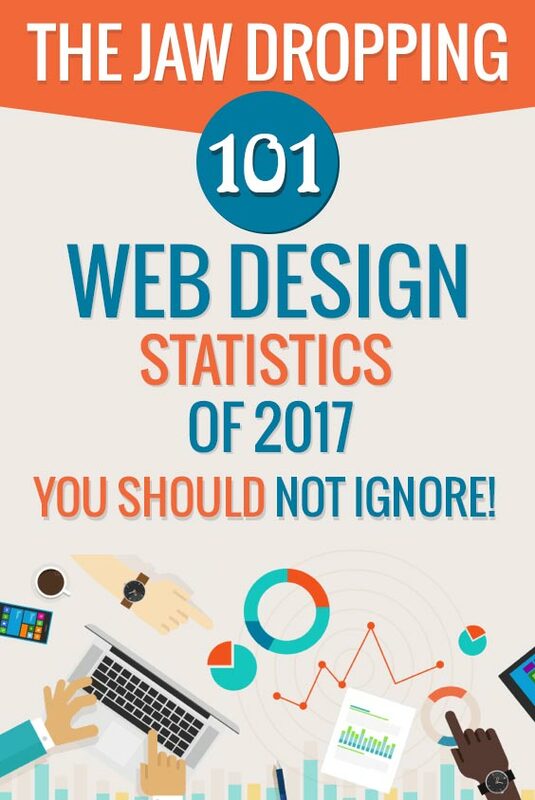 Thanks for reading the 101 Web Design Statistics. If you have any issue related to the content or information on this blog or you want to share a suggestion then feel free to leave a comment below. One of our team members will revert you back as soon as possible. If you are interested in our UI/UX, Graphics, Web design services then kindly contact us using the form provided in the header and sidebar sections, and our project manager will be in touch with you soon.